Next week, astronauts on the International Space Station are getting a brand new room. Called the BEAM, short for Bigelow Expandable Activity Module, the room is launching on top of one of SpaceX’s rockets on Friday; it will then be attached to the ISS sometime within the next four months. The BEAM, which is created by private company Bigelow Aerospace, will remain deflated during launch, but once in orbit, it will inflate up to four times its size, providing more overall volume for the interior of the ISS. The concept of expandable spacecraft isn’t new. In the 1960s, NASA launched a series of expandable communication probes called the Echo satellites, which looked like big metallic balloons. The satellites inflated in space and turned into mirror-like reflectors that bounced signals from one spot on Earth to another. Since then, NASA and other private companies have toyed with the idea of scaling up expandable spacecraft so that they could house humans in space. It wasn’t until recently that technology advanced enough to turn expandable habitats into a reality. In 1991, NASA temporarily pursued the idea of an expandable module called the TransHab, which could connect to the ISS. “At that point, material science had matured,” Mike Gold, the director of operations and business growth at Bigelow Aerospace, told The Verge. “Basically these were materials that were sufficiently robust to provide superior protection in the space environment, yet could be folded and manipulated.” In the mid-1990s, NASA scrapped the idea, but Bigelow ultimately purchased the rights to the TransHab patents and has been working on expandable habitats for over15 years. Now, for the first time, the BEAM will be tested in space. The 3,000-pound module will ride into orbit on SpaceX’s Dragon capsule, which is departing on Friday from Cape Canaveral, Florida, along with an additional 1,300 pounds of food, water, and supplies for the station. During transit, the cylindrical BEAM will be about 7 feet (2.16 meters) long and 7.7 feet (2.36 meters) in diameter. Once the Dragon reaches the station, the Canadian robotic arm will remove the module from the capsule and attach it to the Tranquility node of the ISS. Within four months of the BEAM’s attachment, the astronauts will start the habitat’s inflation sequence and the BEAM will expand to its maximum capacity: about 13 feet (4.01 meters) long and 10.6 feet (3.23 meters) in diameter. That provides about 565 cubic feet (16 m^3) of volume in which astronauts can move around. However, the ISS crew will only enter the habitat about three to four times a year and for a few hours each visit. During these trips, the astronauts will collect data gathered by the BEAM’s five sensors, letting NASA and Bigelow Aerospace know how the module is holding up in the space environment. Bigelow boasts that the BEAM module will add an extra layer of protection for astronauts in space. The company won’t say the exact materials that make up the module, but Bigelow claims the habitat’s design can substantially reduce the effects of deep space radiation, since it isn’t made of metal. When cosmic rays hit metallic space structures, the collisions can produce what is known as “secondary radiation” that further harms astronauts. The BEAM should cut down on that effect, according to Gold. The module’s proprietary material is also designed to protect against space debris, though the company won’t divulge exactly how. One of the main draws of the BEAM is that it’s relatively lightweight for a space habitat. At 3,000 pounds, it is significantly lighter than the metal Unity module on the ISS, for instance, which is made of aluminum and weighs more than 26,000 pounds. NASA was able to transport Unity and the other large ISS modules into orbit thanks to the Space Shuttle, which had a large cargo bay capable of taking upwards of 50,000 pounds into space. But with the Shuttle now grounded and NASA lacking a heavy-lift vehicle, getting such heavy objects into space isn’t an option at the moment. Expandable modules like the BEAM are light enough that they can be launched on orbital rockets like the SpaceX Falcon 9 or ULA’s Atlas V rocket, which can’t carry as much weight as the Shuttle. Another advantage of BEAM is that it remains compact during transit. That design allows Bigelow to get very large objects into space when there is limited room on available rockets. “The fact that you don’t need as big a launch vehicle to launch it means you’re not constrained by the size of the payload,” said Jim Muncy, an independent space policy consultant at the Space Frontier Foundation. Because of this, Bigelow can potentially get more overall habitat volume into space using less rocket launches. “If you have to conduct two launches to put up the equivalent volume you can do with just one expandable habitat system, it’s saving you the cost of that second launch, which is a dramatic cost savings,” said Gold. Plus, the lighter and smaller a module is, the less it costs to launch that module into orbit. The BEAM itself only cost $17.8 million to build, already making it one of the more affordable modules ever to attach to the ISS. And with reusable rockets bringing down the cost of spaceflight in general, getting an expandable habitat into space becomes even less expensive. 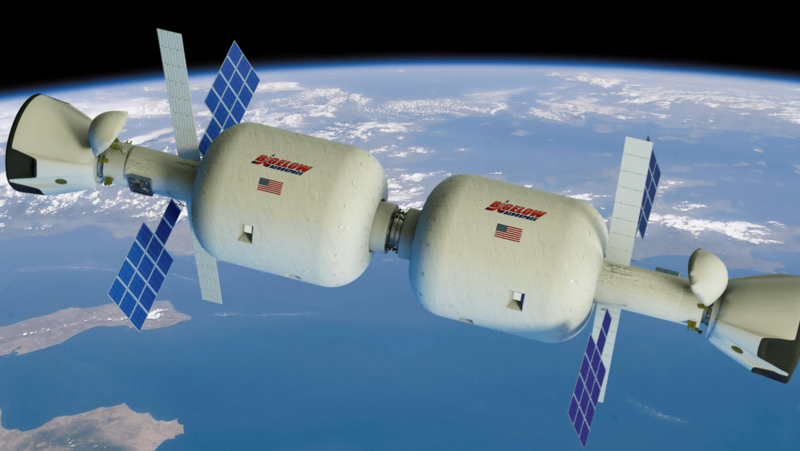 “Just as commercial launch vehicles offer more capability per dollar in terms of getting stuff into space, expandable habitats offer a cheaper way to keep people alive in space,” said Muncy. A FUTURE OF SPACE HOTELS? But a few more things need to happen before the B330 and other expandable commercial habitats become places that people can actually visit. First, people will need rides to these stations. Right now, the only way to transport people to the ISS is with the Russian Soyuz rocket. SpaceX and Boeing will begin transporting NASA astronauts to and from the space station in 2017, so it’s possible these systems will be able to provide rides to a future commercial habitat like the B330. In order for these habitats to really take off, there needs to be some kind of return on investment too. Bigelow could potentially rent out the habitats to scientists conducting research or charge super high fees to wealthy space tourists. “The utility of a module is not just based on total volume,” said Muncy. “It’s based on what you can do with it.” Bigelow also needs to demonstrate that its habitats can keep occupants safe once they arrive. The BEAM doesn’t have a life support system and is relying on the space station’s environmental controls to keep astronauts alive when inside. Bigelow will need to demonstrate its habitats can operate with a working life support system, which the company plans to do with the B330 project. For now, Bigelow isn’t beholden to government regulations when it comes to making and operating its modules. The Federal Aviation Administration is prohibited from regulating commercial activity that happens in space until at least the year 2023, thanks to the US Commercial Space Launch Competitiveness Act of 2015. “We don’t have the in-space authority to regulate what happens between launch and re-entry, but we do care about it,” said George Nield, the associate administrator for commercial space transportation at the FAA. That’s why the agency has a list of recommendations that private companies can follow for keeping people safe in space, and Bigelow has taken this advice into consideration, Nield said.